This NVMe SSD rivals Samsung's 970 Pro in performance, for a lot less dough. Uber-fast NVMe storage for 20 cents per gigabyte? 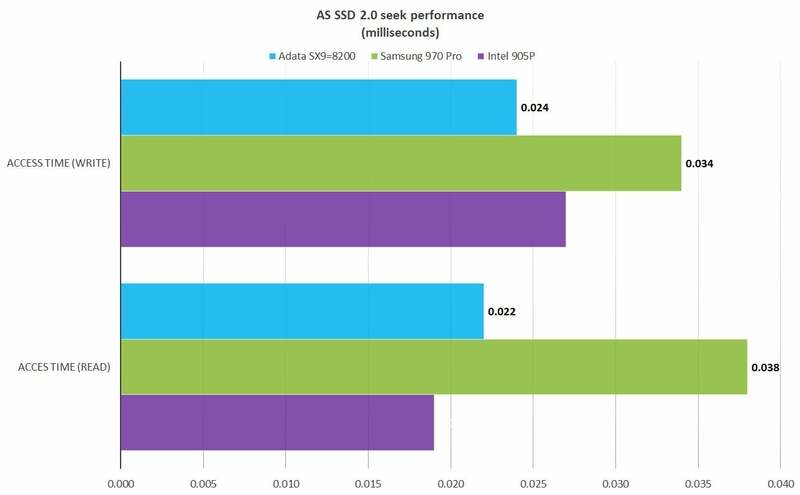 That’s what Adata’s XPG SX8200 Pro delivers. Of course, NAND prices have dropped recently, but until now that’s only been reflected in performance-challenged (on long writes) budget drives. The SX8200 Pro is an NVMe drive that rivals top-rated Samsung’s 970 Pro in performance but is significantly cheaper. 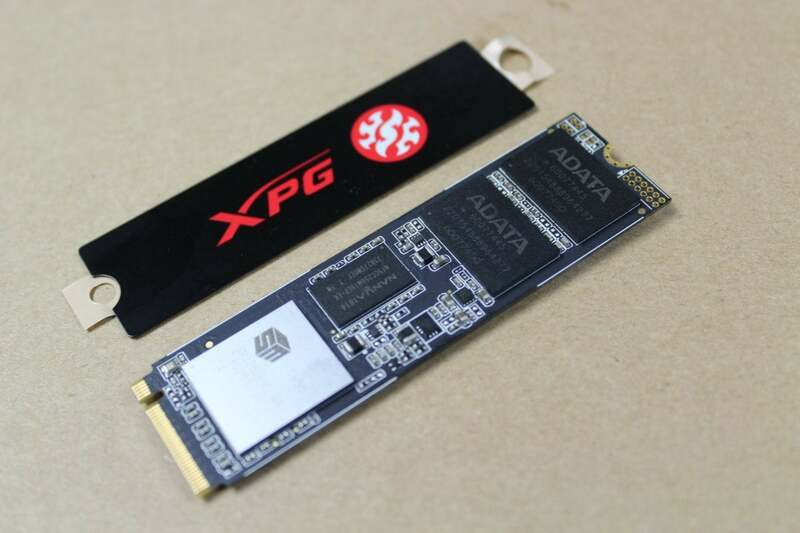 The Adata SX8200 Pro is a 2280 (22 mm wide, 80 mm long) form factor M.2 drive using 3D (layered) TLC (Triple-Level Cell/3-bit) NAND marshalled by a Silicon Motion SM-2262EN controller. It’s a full four-lane PCIe 3.0 implementation, not two lanes like many other bargain-priced NVMe SSDs such as Kingston’s A1000. There’s a DRAM cache on board (an unspecified amount, likely 512MB), secondary cache to the tune of approximately 1.2 percent of capacity, and a tertiary cache that can expand up to approximately 15 percent of capacity. That has a lot to do with the drive’s performance, though it’s no slouch when it runs out of cache either. The SX8200 Pro is by far the best performing drive in its price range. Samsung’s 970 EVO matches if for relatively small amounts of data, but slows down more quickly on long writes. About the only outstanding physical characteristic is the logo’s heat spreader, which the company includes in the package. It’s unattached, but thermal adhesive is already applied so it’s an easy mod to make. It’s not necessary to the long-term health of the drive, but a nice touch. I took Adata’s claim that the SX8200 Pro would perform on a ,par with, or better than the top-rated Samsung 970 Pro with several very large grains of salt. Well, dye my hair red and call me Harpo—Adata wasn't kidding. It competes extremely well with the 970 Pro until you write a very large amount of data. Even when it runs out of secondary or tertiary cache, it writes at a crisp 1GBps. I’ve seen NVMe SSDs drop as low as 450MBps off of cache. 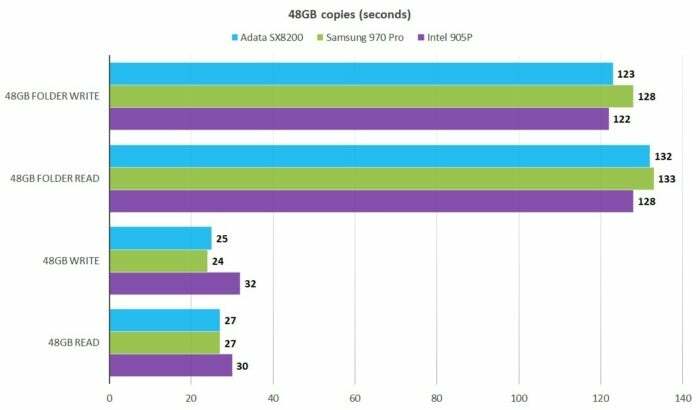 You’ll see the 1TB SX8200 Pro in the light blue bars compared to the aforementioned 1TB 970 Pro and Intel’s 960GB 905P, a fantastically long-lived and fast, but extremely expensive competitor. 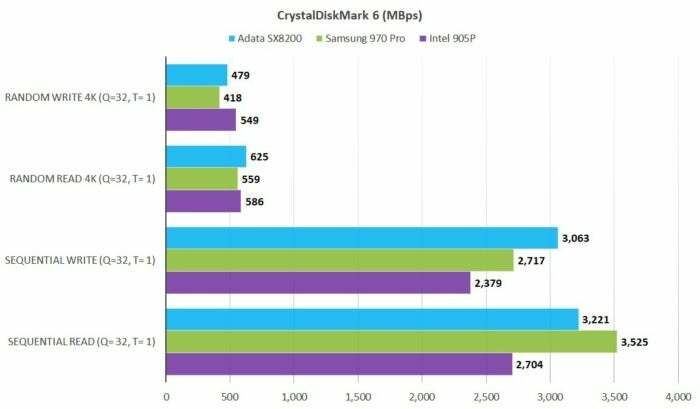 CrystalDiskMark 6 ranked the SX8200 Pro as performing roughly on a par overall with both those drives. For a drive as cheap as the Adata SX8200 to hold its own against Intel’s 905P and Samsung’s 970 Pro is impressive. 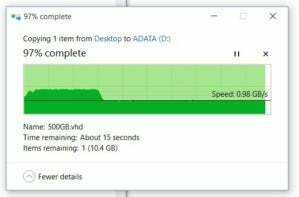 Somewhat surprisingly, the SX8200 Pro matched the 905P’s prodigious seek times in AS SSD. The Adata SX8200 features lightning fast seeks. Better than the Samsung 970 Pros, though there is a lot of variance in this test from run to run. Shorter bars are better. The SX8200 Pro did better than fine in our 48GB real world copy tests. Quite a bit better. The SX8200 Pro does eventually slow down when writing, but not until relatively late in the process. 15 percent (the amount of dynamic cache) of 1TB is 150GB, which is larger than most full 4K movies. The screen capture below shows writes slowing from about 1.8GBps to 1GBps during a 500GB copy. Though the SX8200 slows down at about the 30% mark of a 500GB transfer, the slower 1GBps transfer rate will still get copies done in a hurry. I’ve documented the drop in write speed, but it’s not nearly precipitous enough for me to sweat about it. Still, it is the one area where the 970 Pro still rules. As noted above, the 512GB SX8200 Pro will write a bit slower, and the 256GB model quite a bit slower due to less cache, and/or fewer chips and data paths. They will also likely dip in performance sooner than the 1TB drive due to less cache. Factor that into your decision on which to buy. If you’re moving up from SATA, you’ll be pleasantly surprised no matter which capacity you choose. 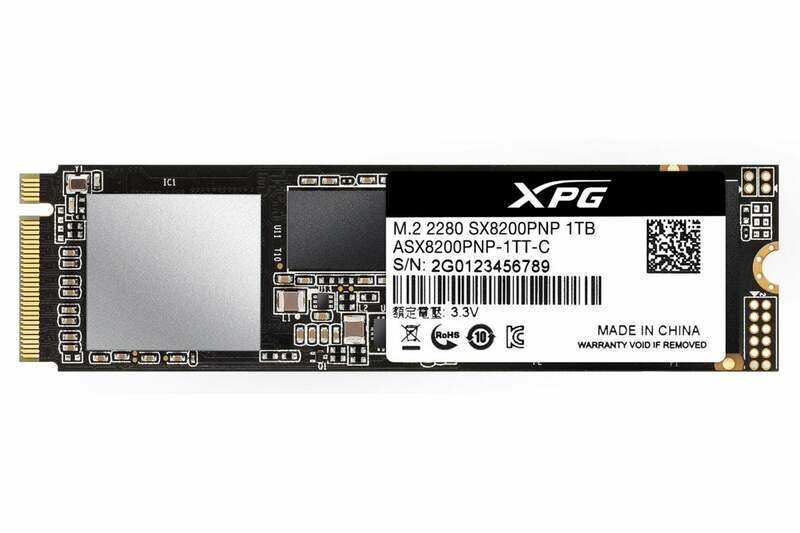 At the time of this writing, you could buy the 1TB Adata XPG SX8200 Pro for $80 less than the 1TB 970 Pro. You really don’t give up much in the way of performance in the vast majority of situations, and the drop isn’t earth-shattering when it does. By Grapthor’s hammer, what a savings! That said, if you regularly write hundreds of gigabytes, then the 970 Pro will still save you time and is quite likely worth the extra bucks. Also, prices are bound to drop on other worthy drives such as WD’s Black NVMe, so take a look around. Adata's XPG SX8200 Pro is as fast as Samsung's mighty 970 Pro the majority of the time, and significantly cheaper. A great drive at a great price.